Reunion Weekend will be held Sept. 28-29, 2018. 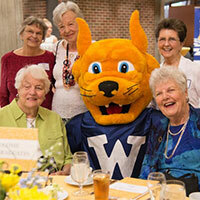 Webster University will welcome back alumni at Reunion Weekend, Sept. 28-29. The weekend will be filled with a number of activities for alumni. Whether celebrating a milestone or looking to reconnect with favorite faculty members or classmates, there's something for everyone during Reunion Weekend. Click here for registration details and the full Reunion Weekend schedule. The 2018 Reunion Weekend will celebrate all Webster graduates, especially the Honor Classes: 2013, 2008, 1998, 1993, 1968, 1963, and 1958. See Sverdrup reimagined! Check out the state-of-art communications equipment, connect with faculty and students learn what’s next for the School of Communications. Sverdrup Hall, 4 p.m.
Visit with Webster alumni authors and make your own Webster button with the staff from the Webster library. See what authors will be attending. University Center Sunnen Lounge, 5 – 7:30 p.m.
View a solo exhibition of New York-based German artist and Webster alumna Alexa Hoyer (BFA ‘03) in the Cecille R. Hunt Gallery, 6–8 p.m.
View the May Gallery exhibit, "St. Louis is Liquid Gold... Love One Another," from Daniel Ballesteros '01, with an artist's talk in Sverdrup 123 at 3 p.m., and a closing reception in May Gallery from 5-7 p.m. The Webster University Young Alumni Chapter invites all alumni to a special brunch where the Class of 2013, Class of 2008 and Class of 1993 will be recognized. Tickets are $20 per person and include a brunch buffet and two drink tickets. Tickets can be purchased online. Edward Jones Commons, 11 a.m. Tune in to short presentations on various topics by alumni and faculty, featuring the two-way conference technology of GenieCast. Check out the full list of speakers online. Browning Hall Auditorium, 1:30 p.m.
Join us for a ceremony and reception as we honor the 2018 Alumni Award recipients. Read more about the alumni awards and recipients online. Enjoy an evening of jazz, folk and pop with alumna Erin Bode. Thompson Music Building Recital Hall and Patio, 8 p.m.